I have to admit that 2015’s The Witcher 3 took me by surprise when it came out. The fantasy epic crept up on me and ended up being one of my most-played games of 2016, and I ended the year with an easy hundred-plus hours sunk into it. The game fascinated me for a number of reasons, but mostly because of the care and detail that developers CD Projekt RED had written into the world. Geralt’s land of Rivia felt living and intricate, with a complex web of politics and character motivations spread over a gorgeously vivid and bright landscape. It felt like everything I had wanted Bethesda’s Elder Scrolls V: Skyrim to be. Both games reveled in their fantasy settings but it was only The Witcher that felt like the politics and the gameplay meshed, whereas Skyrim never transcended being a fantasy playground where occasionally I would find myself in trouble with the law for accidentally shouting someone off a cliff. So when CDPR announced their plans to make a game based on Mike Pondsmith’s Cyberpunk 2020, I couldn’t have been more excited: who better to design a corporate hellscape than the creators of one of my favorite RPGs in recent memory, and one that really felt like it got why the world of Rivia had to be detailed enough to support its conflicts? Cyberpunk (the genre, not Mike Pondsmith’s particular conception of it that CDPR is adapting) has a long and storied history of connection with the sociopolitical context of its day. Early, seminal cyberpunk novels and short stories of the 1980s saw the future as a bleak one, populated by megacorporate structures that would eventually dwarf the nations that birthed them. The primary inconsistency in most cyberpunk revolves around this: That while the systems of the various dystopias are presented as evil, they must also be presented as “cool,” since the marketability of the product requires a certain sense of “cool-ness” in order to be desirable. So the numerous megacorps are horrific, of course, and do horrific things within the fiction, but they are also a key part of marketing material. They make up the background of the world, and the world has to be attractive to the potential player or buyer. So now it’s 2018 and we’re getting the first full length trailer of CD Projekt RED’s interpretation of one of the most influential cyberpunk tabletop role-playing games. It’s a high-tech, colorful and bright interpretation of Pondsmith’s Night City, the primary setting of the original tabletop books. Like all good cyberpunk megacities, Night City is too big and too crowded, an intermingling of thousands of rich and poor citizens in too-close quarters. The trailer is short, and primarily cinematic, but showcases all the expected beats of a cyberpunk metropolis—the augmented mercenaries, the slick suits of the corporate agents, and the dirty under-streets of night markets and back-alley fixers. And like all good cyberpunk, 2077 bleeds cool, the primary definition of modern cyberpunk. We see the grime and the neon juxtaposed. The corporate thugs and the hired guns both sport high-tech weaponry and armor, skin turned hard and bulletproof as bullets fly. This is our cyberpunk: Everything is cool and nothing hurts. If this were another studio, I would be more worried that this visual aesthetic signaled a lack of attention toward the internality of the politics in Cyberpunk 2077. While I’m still wary of it, as any critical gamer should be, the fact that CD Projekt RED managed to imbue The Witcher 3 with such detail in both its primary questline the surrounding ones gives me hope that 2077 will be as thoughtful. 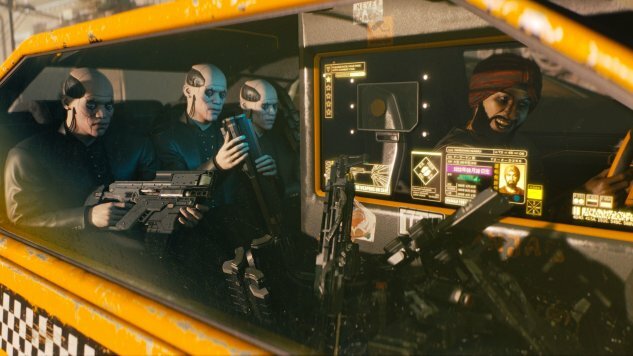 We’ll have to wait a bit to find out (the official trailer didn’t list a release date) but it’s my hope that CDPR considers the weight of the history of cyberpunk when constructing the world and possibilities for the player in 2077. It’s easy to fall into the trap of writing a world that focuses solely on the aesthetic of cyberpunk without the darker messages inherent in a world controlled by unchecked corporatism, violence and individualism. Let’s hope that this Cyberpunk is one that bears that in mind.